Coaching course manuals can be found under Forms. Scheduled Classes can be found under Classes. CHICAGO (Jan. 17, 2018) - Effective today, the U.S. Soccer F and E Coaching License courses will no longer be offered to new candidates as a part of the U.S. Soccer Coaching Pathway. All USSF Coaching Education courses will now be processed through the US Soccer Federation Digital Coaching Center (https://dcc.ussoccer.com). This includes registration. 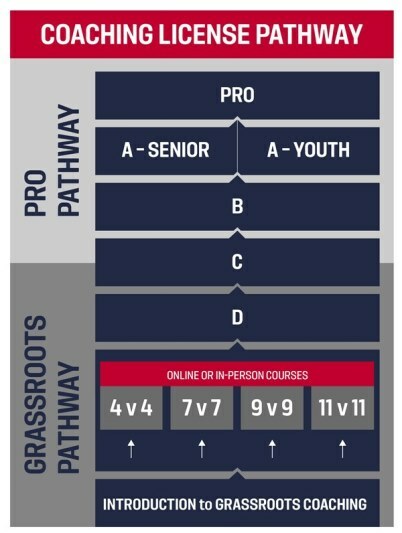 Any course offered that’s a USSF F, E, D, or C, coaches will simply create/login to their DCC coaching profile, find “Courses” tab and then will be able to find all of the courses in the state they are eligible for at the time. Go to the USSF Digital Coaching Center - Create a profile. Then it will list all of the courses that are available to you. Currently, that will only be the F (even if you already have a higher license.) Planning Tools and Online Resources: When you register for the F, you will get access to the DCC Planning Tools and Online Resources.